I am eternally grateful for those who’ve made a difference for “this one.” I am a new person, living a new life. For that reason, I want to be that boy, making a difference. How about you? How do you relate to this story? More people need to have this belief — that making a difference for even just one is so important. If we all helped “just one” this world would be uber-amazing! You made a difference with this post.Many thanks. Most definitely…I have always believed in the Power of One! One person CAN make a difference, don’t let anyone tell us otherwise. I love that story. This much beloved story originally from Loren Eisley will never grow old. And I love Denise’s reminder that in our lives, sometimes we most identify with the starfish and sometimes with the boy. Thanks Elizabeth…if we can all keep making a difference…one person at a time…what a wonderful legacy!! OMGosh. I love this. I’d never heard it before. Yes, every single person can make a difference. Just once gesture, a few kinds words, can change so much. Isn’t it fun to discover new stories like this one? I’m glad you enjoyed it Karen! That is so beautiful! We should all try to be the boy. Yes, that would be a marvelous accomplishment! Thank you Michele! Hi Brad, yes together we move forward!! Thanks! Denise – To make a difference in another’s life is the best feeling in the world. This is the first blog I’ve read today and you’ve touched my heart with a beautiful message. I relate to this story as I was picked up many times when I didn’t want to be. I wanted others to leave me alone on that ‘deserted beach’ and leave me alone in my misery. Praise God, enough friends believed in me, they continued to stand me up when I didn’t have the strength to do so on my own. For many years now I’ve been in recovery and therapy and it’s my turn to recognize all starfish deserve the help I might lend in getting them back to safety and a place where they will flourish. Blessings. Sheri, your words closely echoed what I wrote to my therapist alongside a copy of this story. You’ve planted a seed for me to share that here…feeling vulnerable… Thank you for always nudging me a bit. And thank you for sharing your true heart, you are a gem. Denise – Thank you so much. I’ve always looked up to you and your recovery journey. I’ve made a great deal of progress but still have miles to go. Your wisdom is always on my mind and in my heart. Now that I have you back in my personal reader, I should see every post. This is one of my favorite stories. It is simple yet conveys a profound wisdom. 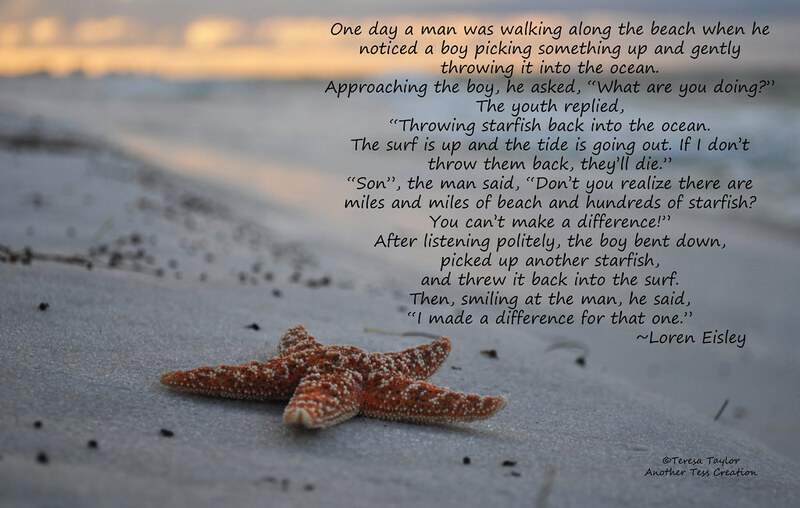 May we all be like that boy and blessed like that starfish many times in our lives. Thanks Russ, I think so too!